Fiona Robberson and the cast of The Bacchae. Photo by Theo Cote. BOTTOM LINE: Dionysus and his wild women worshipers are back on stage again, with masks, puppets, and some impressive performances. The renowned La MaMa Experimental Theatre Club has been a home for avant-garde performance for fifty-five years. On its stages, innovative new works and re-imagined classics are what adventurous audiences have come to expect. 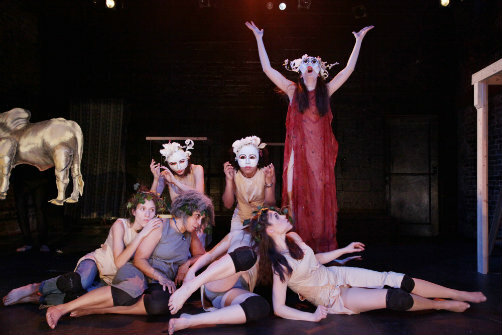 Currently, the Faux-Real Theatre Company is adding to that history with a robust production of The Bacchae. The troupe’s stated mission is to bring a sense of the classics’ original atmosphere to the modern stage; whether they’ve done that is debatable, but with strong central performances and some excellent design work, they have at least mounted a show that keeps you on the edge of your seat. When Euripides first unleashed The Bacchae on ancient Greece, his audience wasn’t watching to find out what happened: they already knew the story. So the playwright’s aim is to bring dramatic tension to a voyage whose destination is never in doubt. His main character is the god Dionysus (aka Bacchus), deity of wine, theatre, and general revelry. But Bacchus is in no mood for a party: he’s come to the city of Thebes to wreak revenge upon its royal family, who happen to be his mother’s relatives. They made the grave mistake of denying Dionysus’ divinity, refusing to believe that he was fathered by Zeus. As punishment, the god has driven Thebes’ women insane, including his own aunts. And he's just getting started. The core dramatic conflict is between Dionysus, played by Andrew Bryce in a fur vest and leather pants, and his cousin Pentheus, current king of Thebes, portrayed by PJ Adzima. Both actors are fantastic, representing two different yet complementary manifestations of narcissism. As the king’s mother, Agave, possessed by the angry god’s violent spell, Fiona Robberson is chilling. Also noteworthy are Tony Naumovski, playing the prophet Tiresias as a southern-fried evangelical preacher, and Aaron Scott, commanding the stage in his brief appearance as a shepherd who’s just seen some crazy stuff up in the mountains. Ironically, the bacchae (Dionysus’ mad female followers) that give the play its title are the least satisfying aspect of this production. The chorus is generally the weakest link in any small-scale mounting of Greek tragedy, and Faux-Real hasn’t managed to avoid this pitfall. It’s disappointing when you’re told that you’re going to see a group of frenzied women dancing and singing in religious ecstasy, and what you get is more like a neo-hippie Earth Day celebration. One almost wishes that people would just refrain from producing the Greek classics unless they really have the resources to cast a chorus as strong as their lead actors. That said, Faux-Real’s The Bacchae contains enough truly inventive and gripping moments to maintain a sense of excitement and danger throughout, even for those of us who, like its original audience, know all too well where the god’s quest for vengeance will end. The Bacchae is by Euripides. Directed by Mark Greenfield. Masks and Puppets by Lynda White. Costume Design is by Irina Gets. Dramaturge is Aaron Poochigian. Musical Direction is by Tony Naumovski. Set Design is by John Milano. Stage Manager is Tamar Lopez. The cast is PJ Adzima, Andrew Bryce, Zora Iman Crews, Zelda Gaye, Jeremy X. Halpern, Joy Kelly, Isabelle Kenet, Isi Laborde, Jy Murphy, Tony Naumovski, Emma Orme, Madeline Adelle Phillips, Fiona Robberson, Aaron Scott, Dorian Shorts, Sarah Traisman, Henry Walker, Annie Sage Whitehurst, and Alexandra Zelman.